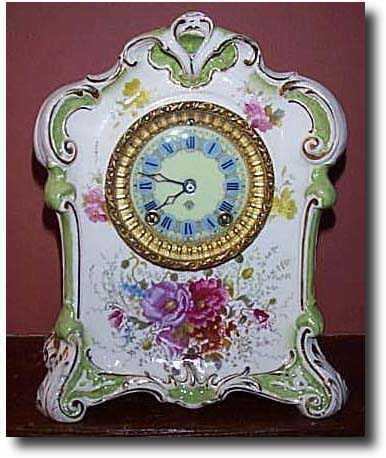 Ansonia Royal Bonn \'La Teste\' Porcelain Mantel Clock The case, dial and glass are all in near mint condition. The clock stands 10 inches tall, 8 inches wide and 4 inches deep. There are no breaks, chips, cracks or crazing that we can find. The colors are gorgeous and sharp. The case has lots of details with curls and swirls. The bezel is brass with beveled glass. The dial is porcelain and beautiful. It displays the Ansonia logo just below the center. The clock has a brass time and strike eight day movement. It strikes on a coiled gong on the half and counts the hour. The back of the case shows the Royal Bonn crest with the initials \'TM\' and \'1755\' and \'La Teste\'. Impressed in the porcelain is the number 1500, the initials GY and a small circular stamp that is not legible. The bottom has a wooden cover. Underneath we found the numbers 3130/6, 4880 and 42. The clock is keeping excellent time.